Cefalù is an enchanting town whose cathedral stands so high on a rocky promontory that it has been a navigational landmark for ships for the last 1,000 years. 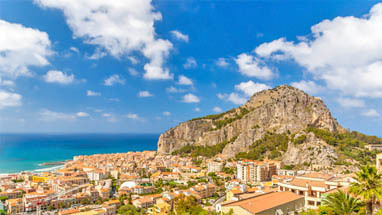 The extensive sandy beaches, overlooked by craggy cliffs, inspired the Norman conquerors of Sicily to found Cefalù as their capital city 1,000 years ago. Only later did they transfer command to the ancient capital, Palermo. In Cefalù they left behind not only a magnificent cathedral, but an intriguing medieval town which remains unspoiled to this day. The rare combination of broad beaches and medieval streets has made Cefalù – like Taormina - one of the most popular holiday destinations in Sicily. Cefalu is nowadays considered the capital of the mountainous Madonie region, one of the largest protected natural areas in the Mediterranean. Cefalù is therefore the perfect destination for a beach holiday and a holiday in the mountains, both at once. 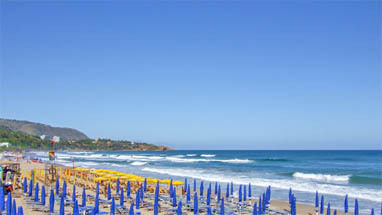 The following pictures give you an impression of the holiday destination Cefalu. The captions tell you where the photo was taken. The colours and numbers refer to the markers on the street map below. 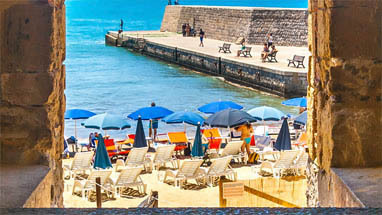 Cefalu is known for its wonderful sandy beach as well as its historic city center. But what is often overlooked is that Cefalù is also the biggest city in the Madonie – Sicily's second-largest nature reserve. 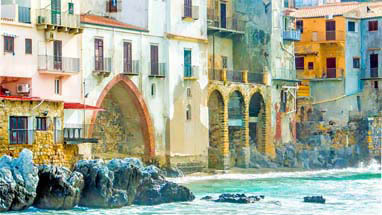 Find out more on the page: Things to see in Cefalu. 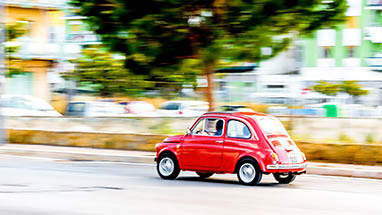 Anyone can visit Cefalu without a single word of Italian. But wouldn't it be nice to pick up a bit of the world's most beautiful language? 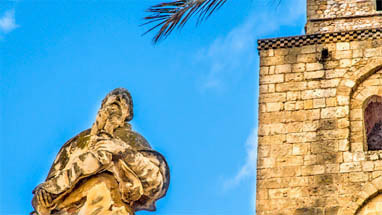 No problem - in Cefalù is a highly-respected language school right next to the town's famous beach. 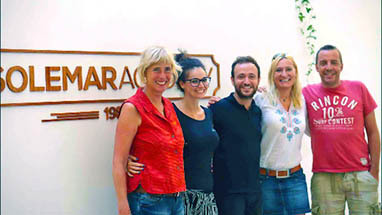 Find out more on the page: Learn Italian in Cefalù. 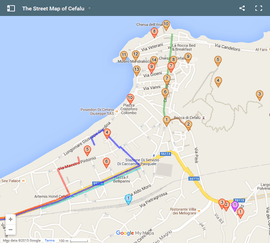 So you find yourself tempted by Cefalù? Then the only real question is: How do I get there? Because it is so close to Palermo, going by Trenitalia or by car is a cinch. Details are on the page: How to get there. From the A20 motorway, access to Cefalu's beach car park. From the beach car park to the motorway, access to the A20. Path to Cefalu's landmark mountain, the Rocca. 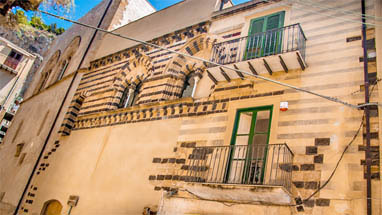 The central street of the old town - Corso Ruggero - is a pedestrian area. The shopping street Via Roma. 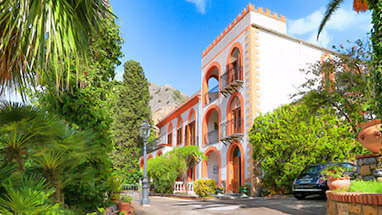 Villa Caterina - Six holiday apartments in a villa set in a Mediterranean garden. Piazza Garibaldi - From here, you can reach the city centre, the beach and the Rocca. A popular meeting place for locals. 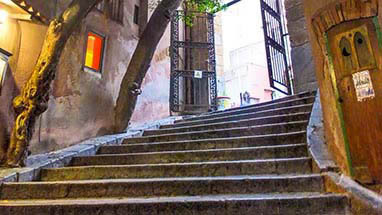 Rocca - The foot of the steps which lead up to the Rocca. Rocca - Remains of a 13th century Norman castle. 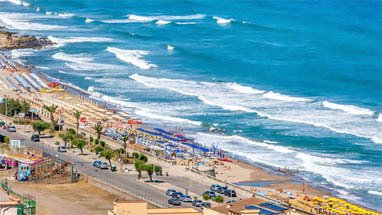 It offers stunning views over the sea to the north, and the Madonie Mountains to the south. Rocca - Remains of the Tempio di Diana. This megalithic building, from the 9th century BC, was a shrine to a local water deity and still contains a water storage cistern. Rocca - Stunning view over the roofs of the city looking down from an old defensive wall. Osterio Magno - This medieval Osterio (fortress) was - amongst others - inhabited by the family of the Norman Kings of Sicily. Chiesa del Purgatorio - the Church of Purgatory. Cathedral Square - The piazza in front of the cathedral is a meeting place for locals and tourists alike. The variety of mouthwatering places to eat makes it a paradise for food lovers. Cathedral - Like many other historical buildings in Cefalù, the cathedral is of Norman origin. Bastione di Capo Marchiafava - A part of the former city walls of Cefalù, which provides stunning views out over the sea. Porto vecchio - The old harbour, and a popular meeting point. Porta Pescara - The only surviving medieval city gate. It leads from the old harbour (brown marker 11) into the historic town centre. 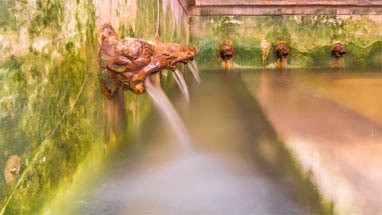 Lavatoio Medievale - Beautifully restored medieval laundry. The diverted river water still gushes through the channels and troughs, where women washed their laundry right up till the 1950's. Museo Mandralisca - This local heritage museum was founded in the 19th century by an enlightened aristocrat. Parking - Low-cost, large car park beside the beach of Cefalu. 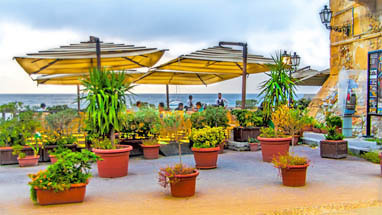 Restaurant - The gastronomic offerings of Cefalù are endlessly varied. This restaurant is unique as it extends right out over the sea. Bar, restaurant - A charming venue for those who like to eat surrounded by modern art, photography and literature. A fascinating contrast to the medieval flair of the old town. Bar, restaurant - The special attraction of this restaurant is its beautiful location, adjoining the old town and the beach.